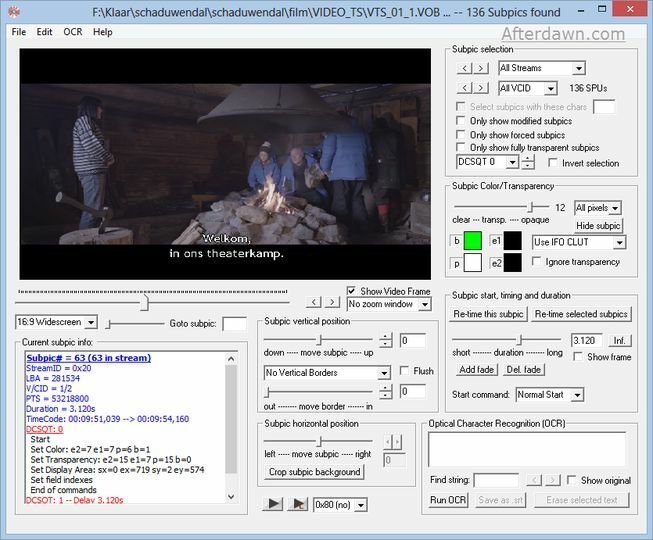 DVDSubEdit allows you to visualize and make modifications to the subpics (subtitles or button highlights in menus) directly inside the VOB files, without the need to demux and remux the subpic stream. It scans the vob file(s) for subpicture packs and parses the packs to display the subpicture data. Then it displays the subpicture commands, along with their parameters, allowing you to move the subpicture up and down in the video frame and change the color and transparency of selected pixel types. It's also possible to change normal subtitles into forced subtitles and vice versa. It crashes whn import image. Zero software.